Windows 8 PCs contain a new technology called Secure Boot that only boots devices that have been verified by Microsoft. Also Microsoft's own Offline Defender won't boot on Windows 8 PCs with Secure Boot on. Neither will Norton's Bootable Recovery Tool. 1. It got a Master Boot Record. : In other words, it boots on BIOS-based PCs, essentially all PCs prior to Windows 8. 2. and it got UEFI boot partition : It also got a UEFI boot partition, so it will boot on PCs with the latest UEFI firmware too. 3. It's 32 bit : There's a 32 bit operating system on the stick so it will work with 32 bit microprocessors. Most rescue ISOs\disks are 32 bit only, so by default they work on 32 bit processors and 64 bit processors. 4. and it's 64 bit : All new Windows 8 PCs use UEFI, and will only boot 64 bit operating systems (unless UEFI firmware settings are changed). So, there's also a 64 bit operating system on the stick. The user doesn’t have to know if their processor is 32 or 64 bit, the FixMeStick figures it out and loads the right operating system. 5. It supports Secure Boot : Its boot loader and operating system kernel are based on Ubuntu 13.04 which are signed with the Verisign\Microsoft key and the signature is stored in the UEFI Key Enrollment Key database, so it will boot on PCs that ship with Windows 8 without requiring the user to fiddle with UEFI and Secure Boot settings. 6. and the USB storage device is under 1024MB : There is a generation of PCs that won’t boot external drives greater than 1024 MBs. 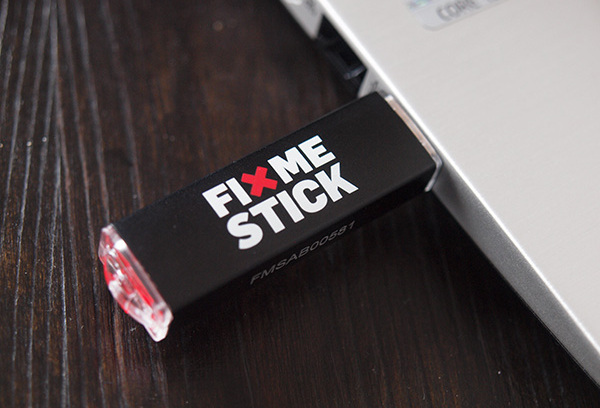 To work on the most different types of PCs, we have to use a USB flash drive with under 1024 MBs of storage. "Of course the vast majority of our customers don't care about the boot architecture, they just want it to work so they can get back to using their PC as they please."